Within your MySagePay you are able to process transactions through your account. MySagePay has a virtual terminal available to you where you can directly enter transactional details and process a transaction. In order to process a transaction you will need to log into your MySagePay account. Before doing so however, you must first ensure that the user you plan on processing the transaction with has the privileges to do so. 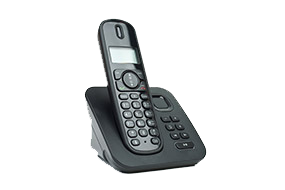 Before you can use the virtual terminal in MySagePay you must first have active on your account a Mail Order Telephone Order (MOTO) merchant number. If you do not have a mail order telephone order merchant number on your account you will not be able to process transactions through your MySagePay. 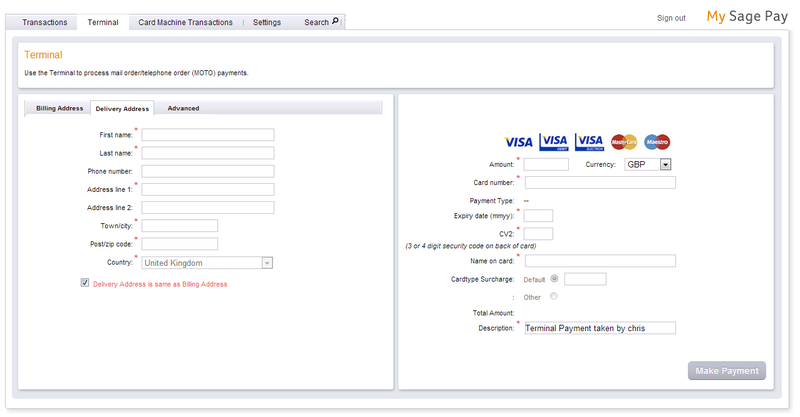 Now that you have logged into your account you will be able to select the Terminal tab along the top of your MySagePay. 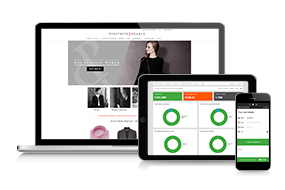 You will then be able to enter the details of your shopper directly into MySagePay. 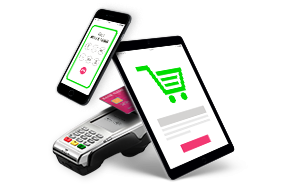 Now that you are entering the details of your shopper into the terminal screen you are able to enter and amend a number of details for the transaction. If your shopper would like to have a different delivery address added to their order you are able to do so. Simply complete the details on the Billing Address tab, select Delivery address and you will then be able to enter the additional address details. Alongside adding additional addresses to your order, you are able to change the transaction reference, and implement specific fraud prevention checks. 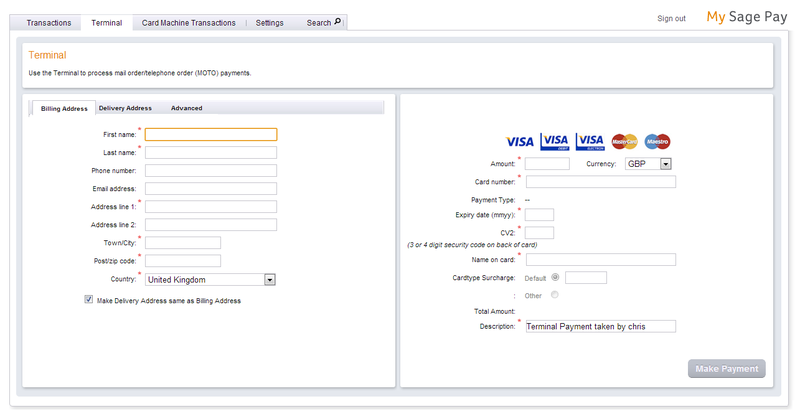 By clicking the Advanced tab you will be able to make the changes to your transaction reference and fraud checks. Once all of your shoppers personal details have been entered you will only need to enter the card details into the terminal in order to complete the order. If you would like to process your transaction in another currency you have the option to select from the available currencies from a drop down list next to the amount on the card details screen. You will only be able to select from currencies that are supported on your sage Pay account. Important - If you do not have a merchant number for the currency you would like to process you will not be able to do so. Sage Pay will only allow vendors to process transactions in currencies that they have valid merchant numbers available. 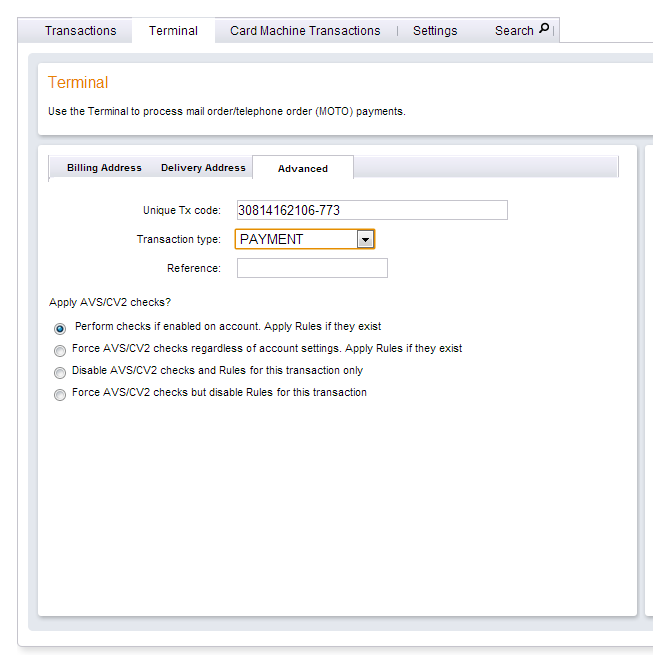 After you have entered the card details into the terminal you will now need to select the Make Payment button. You have now processed a transaction through your MySagePay.